While most of the hotels and bed & breakfasts featured on Nights in the Past can claim connection to famous figures on account of them having stayed at some point in their respective histories, a number can actually boast being the birthplace of historic icons. 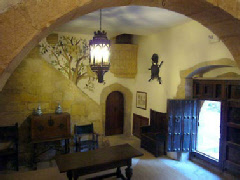 The Casa de Orellana is one such example. Indeed, the man who “discovered” the Amazon, Francisco de Orellana, is reputed to have been born in the house in 1511. An explorer and conquistador, a province of Ecuador is even named after him. The building today offers just five rooms, each individually furnished and named after figures involved in the Amazon River expedition or the life of Francisco de Orellana.